The term "mind programming" may have varying meanings applied to it, depending on the particular scenario in which it is used, but for the purpose of this particular discussion, the particular meaning which shall be applied and maintained here throughout, may be encompassed by the word: Beliefs. As it may be connected to the subject of how the mind works, the word "programming" has, as one of its meanings: to cause to absorb or incorporate automatic responses, attitudes, or the like. And, if or when any person gains an awareness of the subject of the Mind, they will see for themself that this meaning carries significant weight. Stated simply, an understanding of mind programming affords a key (if not THE key) to understanding not only our past experiences, but also our present ones, and may even serve as a relatively accurate means of predicting our future experiences. And another important consideration shall be presented in this discussion - namely that, in similar manner as Thinking is a perpetual process, which is perpetually setting some sequence of causation into motion (both on an individual basis, as well as on a collective one), mind programming is also a perpetual process, also operating both individually as well as collectively. That consideration also carries certain ramifications with it, which shall be revealed as we progress. Much of what shall follow has been touched upon in some degree in previous discussions, but this Author shall seek to link things together in a coherent form, so that the full significance of mind programming might be grasped and comprehended, so that the inquirer may be in a better position to give it practical application. And, while it should be obvious, it will nonetheless be mentioned: the practical application of mind programming, to any degree, should never be with the intent of dominating another person, taking undue advantage of them, or in any way denying them of that liberty of action (whether mental or physical), which can be said to be a common aspiration of all mankind. It will be touched upon in perhaps more detail in another section, but for now, it should be enough to state that any such action - even if done unintentionally - constitutes a contradiction of one of the fundamental laws of life, and, if it is not arrested, will sooner or later reap a corresponding penalty upon the offender. Now, if one were to trace the sequence backwards, i.e., from end to beginning, it can be established that the experiences as each person realizes them in their individual objective or physical world, may be said to be composed of all of the various Results that they obtain in all the various areas of their lives. The Results themselves are an inevitable product of two things - the actions the person performs, as well as the conditions upon which those actions are performed. 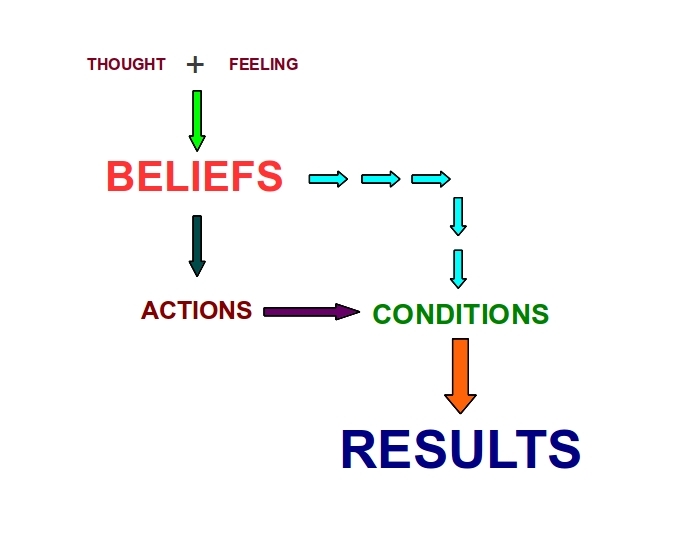 The actions a person performs have their ultimate origin in the thoughts or ideas established and resident in their subconscious mind, i.e., in their Beliefs. 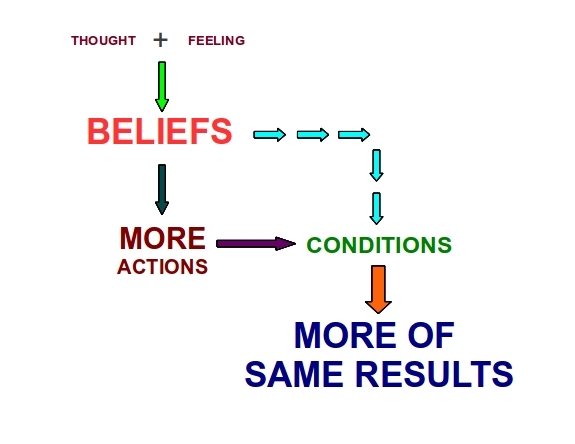 Similarly, the conditions that present themselves in the individual's objective world can be shown to correspond, or match exactly, their Beliefs. This is merely one way to trace out the sequence by and through which, "thoughts become things". And the sequence illustrated by the diagram hereunder also applies similarly to the collective experiences of the entire race of Man. It was first mentioned in the discussion on Faith, and expanded on further in the discussion on How The Mind Works, that a Belief is, simply stated, a Thought or Idea, "fused" or "mixed" with Feeling or Emotion, and it was also mentioned there that Feeling or Emotion is that "vital element" which is required in order to set the Creative Power of Thought into motion. 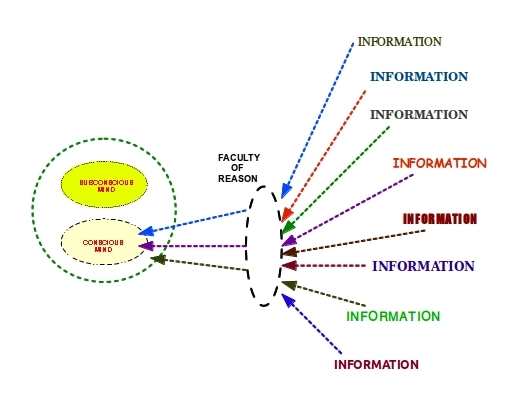 And it was also mentioned via the discussion on the Mental Faculties, that a person who gains an understanding of the use of those faculties may actually choose and determine the Thoughts - and ultimately, the Beliefs - with which they may operate, primarily via their exercise of the faculty of Reason. Now, it has also been mentioned previously, that, for the most part, Man comes into the physical world, with the mental faculties being, for all practical purposes, dormant. Consequently, the mind of a human infant is, for all practical purposes, wide-open to absorb any and every thought, idea or suggestion that is presented before it. (b) the "wide-open" individual mind does not discriminate or select the type of thought or idea it shall absorb. As stated previously, there is nothing inherently wrong with the mind being "wide-open", for a human infant. Virtually every person who has ever lived has operated in such a state, at one time or another. By itself, it is how the human learning process begins. 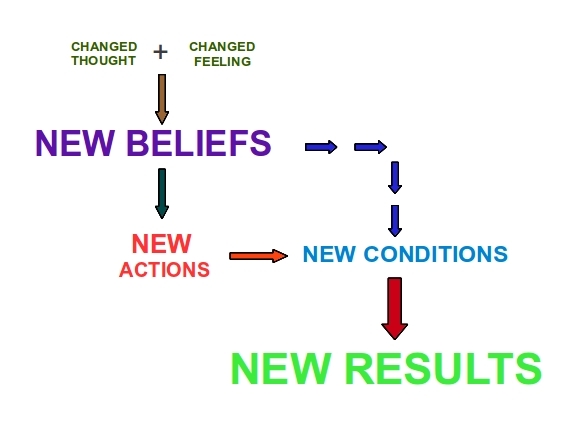 It may only become a problem, if the person never becomes aware that the mind programming that occurred in their infant years, if left unchanged, ultimately determines the actions they perform and the conditions that take form later on in their individual world, i.e., the cumulative quality of their future life. And there is ample evidence to be found of persons who are effectively stuck in some position or state, because of the mind programming they experienced as infants. It can even be traced out in most (if not all) instances that they are unaware of how they had been programmed, and also, because they have no conception that they have been programmed to operate in a particular way, or that they can change their programming, they remain where they are, for virtually the course of their lives, despite any and all efforts to change their results. Many of these "stuck" persons take on the suggestion that if they "work harder", i.e., putting more time, effort and energy into one's activities, they will sooner or later change the results they are presently obtaining. To put it simply, there is abundant evidence to support the argument that working harder cannot and will not being about any change in results; more often than not, it merely bring forth more of the same results previously obtained. In addition, and in similar manner as the recommendation stated in the discussion on the Mental Faculties as to why "will-power" should not be employed at all, the notion of "working harder" can be shown as supporting the Belief that there is some adverse force standing between a person and some desired result which must be fought against, and that the only means of overcoming this adverse force is to put out more time, energy and effort. Such an approach, i.e., the marshalling of one's forces to handle a heavy object, might indeed have relevance in the physical world. However, in accordance with the proposition stated many times previously - and in many ways - that the Creative Power of Thought is perpetually creating something, in accordance with the Belief that has been established, the Belief that one must employ "hard work" literally results in the creation of the adverse force to be fought against. Again, this can be traced back to a sequence of mind programming which essentially established the Belief in the person's mind that external actions are the only creative or causative agency that he or she can set in motion. Fortunately, and by virtue of gaining an understanding of how the mind works, any person can. so-to-say, awaken in awareness to the converse proposition that, by making conscious, deliberate and proper use of their creative instrument of Thought, they can - perhaps indirectly, yet surely - cause the creation of more favorable conditions in the sphere of their individual world, and the resulting actions that they then perform upon those favorable conditions become (relatively speaking) much easier and more effective. This itself may constitute "working smarter, not harder". And a brief mention shall be given to examples of mind programming aimed at the mass of mankind. Perhaps the most obvious example of mass mind programming is the phenomenon of advertising, which has been touched upon in the discussion of the Mental Faculties. It has also been mentioned in times past, and every so often is raised again, that various scientific or technological techniques, such as subliminal messages (either audible or visual), broadcasts of so-called ELF (extra-low-frequency) radio waves which (according to some theories) affect normal brain activity in humans, etc., have been used in the past (and, according to some theorists, are in use even today) by so-called "big business interests" and even governments to effect control over the masses via mass mind programming. Various arguments has been put forward, and it may still be an issue for some, that the Television and its prevalence in modern-day society, actually constitutes the "front- end" through which mind programming is effected upon the millions (if not billions) of persons, who, so-to-say, "switch on, sit down and surf", on a regular and ongoing basis. And, in passing, the phenomenon of cults and other similar societies, who, from all appearances, apply one or more methods of indoctrination to effectively "lock-in" otherwise unwilling persons unto themselves, may be considered another example. Notwithstanding, the major inference this Author wishes to put before the inquirer, is that there is (literally) no need to fear or worry that someone out there - whether individual or organization - is seeking even now to, so-to-say, turn us into mindless drones, as is portrayed on occasions in popular media. As mentioned earlier in this discussion, from both the philosophical and metaphysical standpoint, it can be propositioned that any and all such actions will, if persisted, sooner or later, "pay themselves back" unto the originator. Moreover, it has also been volunteered (not only by this Author, but also by others), that a clear and definite understanding of who and what Man really is (i.e., our mental and spiritual nature), carried over into practical use, will keep us "forever guided, guarded and protected", from any and all attempts of mind programming for malicious purposes. And that practical use, in summary, entails the individual programming their mind with the definite aim to operate with particular thoughts, ideas and suggestions, and, by employing their mental faculties, blocking out any or all thoughts, ideas or suggestions, which may be adverse to their aim. It should be kept in mind that a person may never totally shut out those undesired thoughts, ideas and suggestions, but at the least, they can prevent them from gaining any foothold in their subconscious mind; without which, they cannot exercise any power or influence. 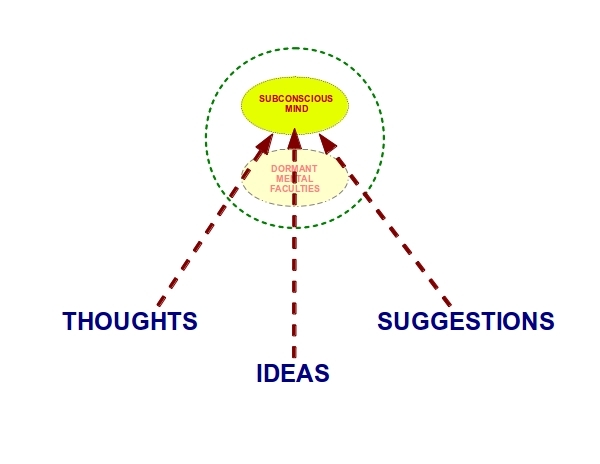 This may be illustrated by a diagram first introduced back in the discussion of the Mental Faculties. As to practical insight regarding how any person can gain the understanding of how the mind works, and thereby employ mind programming so that their creative faculties work for them, and not against them, said understanding can only come about by one way - and that way is through studying; in this instance, studying about the mind and its working. It may even come as a surprise to some that the knowledge of how the mind works - both practical as well as theoretical - has existed and been recorded for (literally) thousands of years. Much of it can even be found contained in some of the writing collections generally associated with philosophy and religion, and as stated elsewhere, science in our time has made advances in substantiating to various degrees what is contained in those writings. Whether one elects to peruse those ancient collections of literature, or any one of many modern-day works (which contain the same essential information) is a choice each inquirer shall make for themself. One of the key points - if not the key point - this Author wishes to leave with the visitor is that mind programming is, far from being some some abstract concept, having little or no practical bearing, a very real and practical thing. In addition, and as stated before, by virtue of our very nature, mind programming is perpetually in action, whether or not a person has any awareness of the subject, and therefore each and every person has a choice forever before them - either to let the process run "whither it will", or to give it conscious and deliberate direction. And, as might be expected, there are consequences to the choice which is ultimately made, from which no-one is exempted. The choice - and the resulting course of action arising out of that choice - can only be made by the individual, for the individual. Another person might offer advice or recommendations, but each of us (Author included) shall sooner or later make our choice. "It is not easy to do this, but it is possible. It is possible because man can think what he wants to think and by scientifically thinking what he wants to think, he can impress what he wishes upon the subconscious mind."